As the nature of the hotel industry is changing and a new form of personalisation lies ahead, the hotel design philosophy of the northernmost hotel in the world, Javri Lodge, appears to be right in time. Bolon took the chance to sit down with renowned hotel owners, the local partners Juha and Katja Mehtajarvi to talk more about their unique boutique hotel philosophy. Located in Saariselkä, 260 km north of the Arctic Circle in Finnish Lapland, Javri Lodge claims to be the northernmost hotel in the world. It’s a wooden chalet style boutique hotel which attracts visitors who are seeking an escape from a hectic life, often craving an opportunity to experience an intimate connection with nature – while simultaneously staying in a hotel which reflects their ecological and sustainable values. 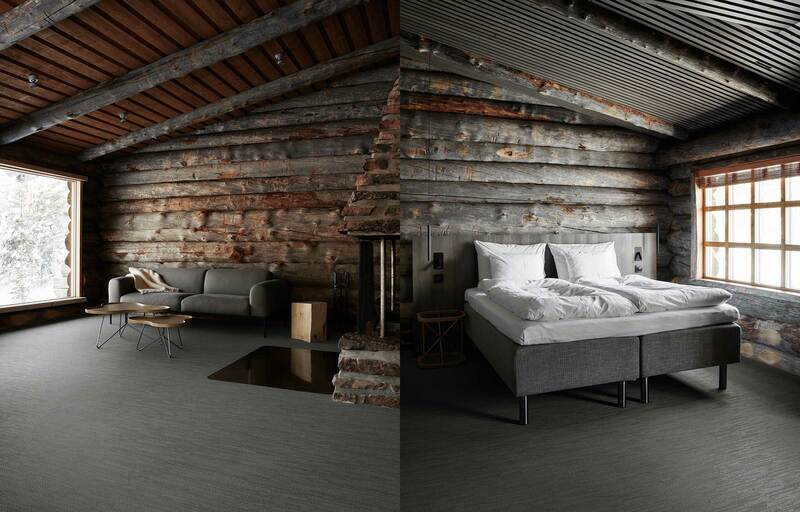 Their choice fell on Bolon’s flooring due to the sustainability aspects of the flooring, especially its durability and the fact that Bolon’s products consist of 33 % recycled material. A choice that was tricky to make, yet one that proved to be the right one. “Maybe that’s still a bit challenging for us, to choose the right materials. But Bolon proved us right. We can see that the element that has raised the most interest among our visitors, in the interior design, is by far the flooring. That has opened our eyes – it was the right choice after all. Bolon for us is a modern kind of sustainability”, says the couple. The most important aspect in the choice of flooring was not to choose a design element that would be a competitor to the walls but rather highlight the wooden feeling of the lodge. “We wanted those kinds of old-style elements in the wooden building. The flooring we fell for (BKB and Now) is very much like these old-style linen cloths, used in saunas as a seat cover in Finnish “laudeliina”. The pattern is exactly like that… The kind we used in the 60’s and 70’s – which happens to be the same time those log-walls were built”, says Juha. 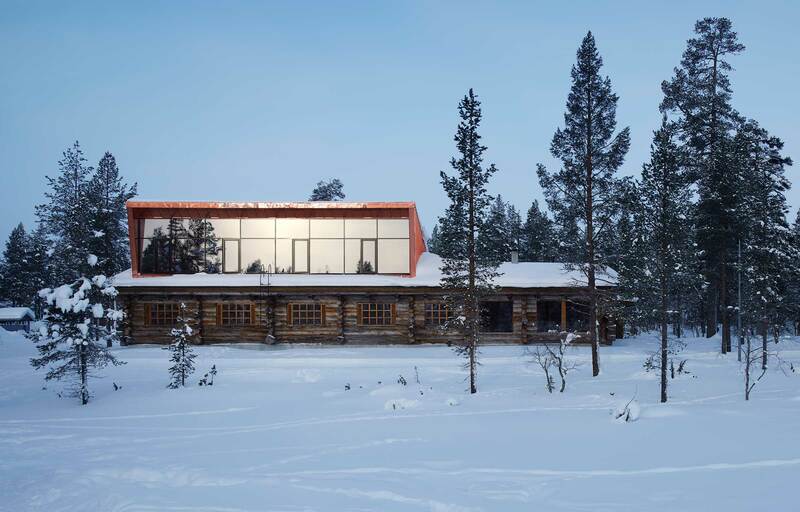 Apart from sustainable values, a nature-inspired look, and a close connection to nature, the Mehtajarvi owners strongly encourage guests to communicate with each other instead of talking to others via their digital technologies. Cellphones are banned in common areas and only allowed in the hotel rooms, where the owners deliberately chose to not place a TV. So that guests would truly experience the peace and calm of Lapland, free of distractions. Javri Lodge – the Future of the Hotel Industry? After more than half a century with huge growth in the travel and tourism industry, a hotel experience has become more than just a hotel. Fatigued by the impersonal experience of hotel chains, it seems like people increasingly seek to take away or learn something unique from their stay or experience. Just like they do at Javri Lodge.